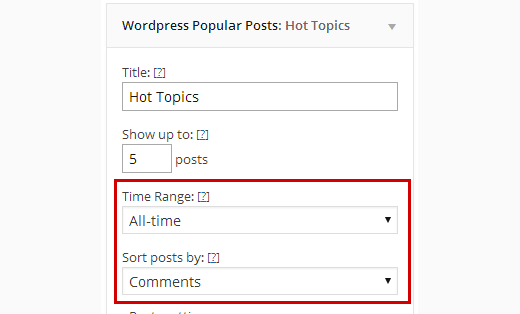 We are often asked by our users, how they can show their most commented posts in sidebar of their WordPress site. It is a good idea to showcase the content that sparks discussion on your site. It helps you build a community around the discussions on your website, which means more user engagement and more visits for your website. 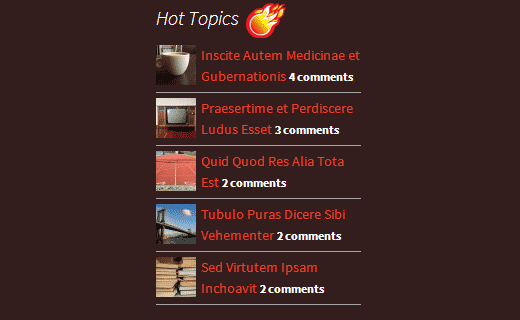 In this article, we will show you how to display most commented posts in your WordPress sidebar. First thing you need to do is install and activate the WordPress Popular Posts plugin. 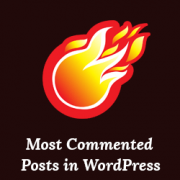 We mentioned WordPress Popular Posts in our list of the best popular posts plugin for WordPress. It can show your popular posts by comments count as well. Upon activation, simply go to Appearance » Widgets and drag and drop WordPress Popular Posts widget to your sidebar. You will notice that WordPress Popular Posts widget comes with many configuration options. To display your most commented posts, you need to select Comments under Sort Posts By option. You can choose a time range from last 24 hours, last week, last 30 days, or all time. For example, if you wanted to show most commented posts during last week, then you can select last 7 days as the time range. To display your over all most commented posts, you need to select All Time in the time range. Among other options, you can choose to display thumbnail, comment count, post excerpt etc. The widget also allows you to choose post type, which is very useful when you are using custom post types on your site. For a full list of parameters you need to go to Settings » WordPress Popular Posts and then click on FAQs section. You will have to scroll down to the shortcode parameters question and click on it to expand. We hope this article helped you display most commented posts in your WordPress sidebar, posts or pages. If you are looking for tips on getting more comments, then check out our guides on adding a simple user ranking system in WordPress or featuring and burying comments . If found this article useful, then subscribe to our YouTube Channel for WordPress video tutorials. You can also catch us on Twitter or Google+.